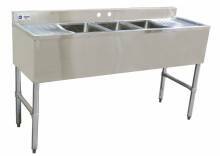 At Zanduco Restaurant Equipment & Supplies, we want to provide you with a large selection of products that will be beneficial to the efficiency and flow of your unique kitchen or food service establishment! Forced to serve merlot in a stein, or a gin and tonic in a coffee mug? Think again! The underbar sinks provide you with a proper, efficient way to clean glasses, without having to leave your busy bar to get clean glassware! Whether the kitchen is busy or slow, don’t rely on them to get your glassware clean! With our 3 tub underbar sink, never run out of the perfect glass for your perfect drink! Clean your glassware when you need it!